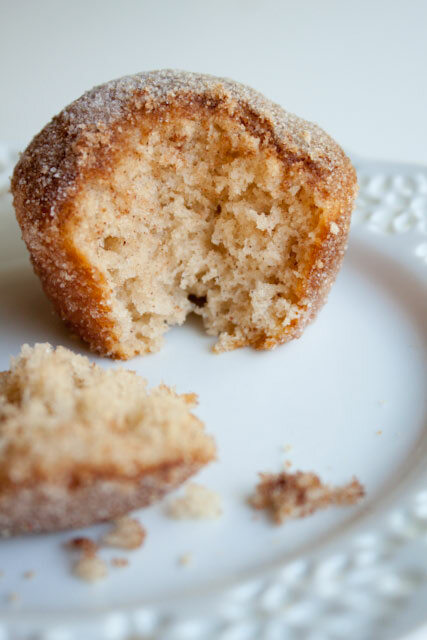 These cinnamon sugar crusted coffee cake muffins are one of my favorite weekend treats, and probably my most requested. I first found the recipe on Tasty Kitchen and knew I had to make it. Anything that claims to taste like a doughnut is welcome for breakfast at my house. The morning I finally baked them up, I liked them even more than I thought I would. They had this faint crunch and grit from the sugar crystals on the outside, and on the inside, this old fashioned doughnut flavor–warm and gently spicy and just dense enough to really sink my teeth into. I made them a half dozen more times over the next few months for friends and family and tweaked the recipe just a bit here and there. 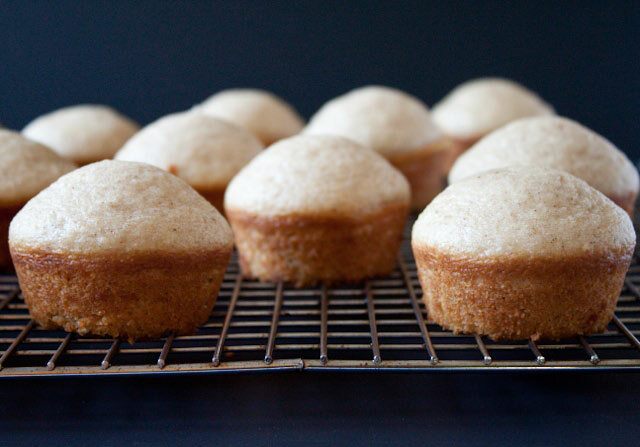 They were instantly everyone’s favorite muffin, and my favorite to make, too, because the batter was a cinch to whip up. The key, though, was eating them warm. That’s when they taste their best, when they’re softest and moistest. So I’d highly recommend making and serving them fresh and warm. If you want to limit the amount of butter and sugar overall, you could easily brush it on with a pastry brush (and maybe limit the butter to the top of the muffin) and use your hands to sprinkle the cinnamon-sugar on the tops only! Make a batch this weekend for friends, family, yourself…anyone you love–they’re always a huge hit! 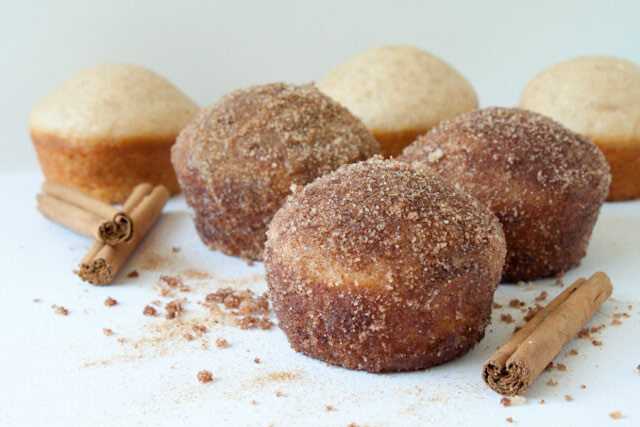 These taste just like an old-fashioned doughnut with cinnamon and sugar. Be prepared to make more immediately because they'll be gone in no time. .
Preheat the oven to 350º F. Whisk together the flour, baking powder, salt, nutmeg, and cinnamon. In a separate large bowl, whisk together the oil, sugar, egg and milk. Add the flour mixture to the oil and milk mixture and stir just until combined. Coat a standard 12-cup muffin pan well with nonstick cooking spray and divide the batter evenly among the cups. Bake for 15 to 18 minutes, until a toothpick inserted into the center of one muffin comes out clean. Run a knife around the sides of each of the muffins and shake them out of the pan while still hot. Place them on a wire rack while you assemble your toppings. In a small, shallow bowl, melt the butter. In another small, shallow bowl, combine the sugar and cinnamon. 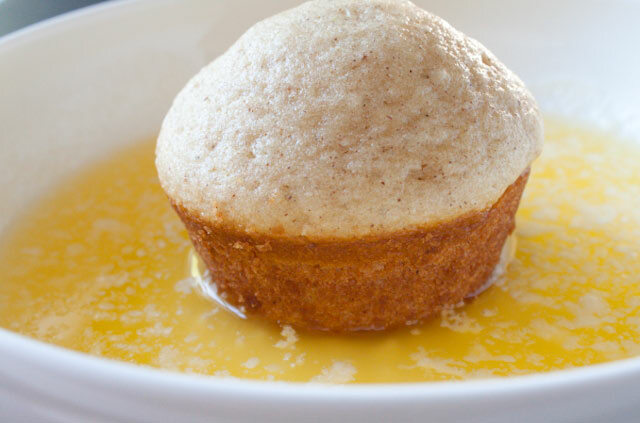 Dip each muffin first in the butter, then into the cinnamon-sugar, swirling to coat all sides. Let cool for a few minutes on a wire rack so that the butter and sugar can harden slightly before serving. These are best when eaten warm, fresh from the oven, but consuming them at any point on the day you make them is just as lovely. I love a good ol’ fashion donut — this reminds me of going to the fair. I think if I scratch my computer screen, I might be able to smell them! Haha, thank God our grandmothers didn’t disown us on the spot! And you’re right- they’re a lot like the kind of old-fashioned donuts you find at a country fair! just found your recipe and not being a cook or very intrested in cooking, I decided to make these. They turned out perfectly and hubby thoroughly enjoyed them. Even got the conversions right for Australian cooking! Carolyn@lovinlosing.com– you could substitute the white sugar for light brown sugar, natural sugar, or even the stevia crystals which is all a plant. For the butter, use coconut oil or agave nectar for the sweet taste! You won’t miss the fatty stuff. Your posts always make me laugh :-D Those doughnuts-no, wait, I mean muffins-look delicious!! I really appreciate the quality of your pictures! They are great to look at! How do you get such a nice shape to your muffins….mine always are flat on the top….yours are ….almost….almost…too pretty to eat! Doughnuts, muffins, whatever. I don’t care what you call them–they look great. I love how they pop up at the top. But really I love the butter-cinnamon-sugar topping. How on earth did you make these muffins with the rounded tops? I just love them…. You know, I honestly have no idea and I’m wondering if it was just an error in my preparation that made them pop up like that in the middle. I wish I could replicate it every time! I can never get over how great a writer you are. I know I say it every time but your words just leap off the page. Hi Tina, Thank you so much for your constant encouragement. To be honest, this morning when I hit publish I thought about deleting it all and starting over. I really appreciate your kindness. Always! Those look soo good! You make everything and anything look so darn good. I tried your sugar cookie recipe last weekend but my cookies certainly did not come close to the batch you made. Yours were perfect mine were not, haha. Baking is definitely an art that you have mastered! Em- totally agree with Andrew- cake donuts would be my weakness too! No way would I cheat and go off my GF diet, but I sure am going to give these a try with a GF flour blend! Those muffins look so yummy. I haven’t had a donut in ages. They remind me of being at the beach. When I used to nanny, donut Saturday was one day of the week I really relished. Ohhhhh these look really great! oh my gosh these look soooo tasty! they kind of look like snickerdoodle muffins! Love reading your memories. And those muffins…..I don’t know what to say. I am writing the recipes down right now. A doughnut you don’t have to fry? Sounds like heaven. I have been dreaming about these since I saw this post. Literally. The only thing holding me back at the moment is that I’m out of eggs. I may have to run across the street for some. In fact, it might be a life or death situation. 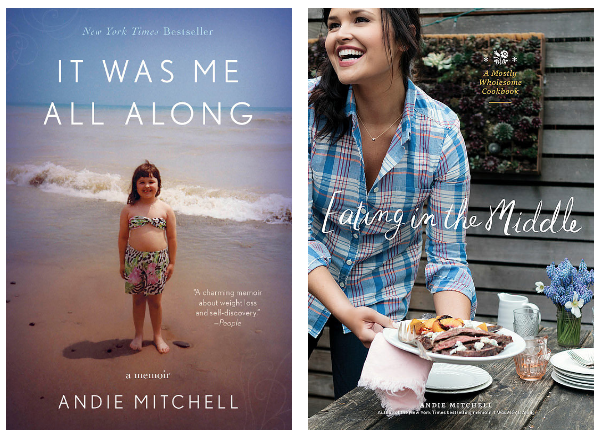 I just discovered your blog two days ago, and I’m already completely, totally, and unabashedly in love. I hope you know that your comment made me smile as big as can be. And that’s pretty big, because I have an enormous mouth. Thank you for your kindness. I hope you do make the muffins. You’ll die and go to heaven. Here you go! Hope you enjoy them if you decide to bake! Pingback: Petite Lasagnas « Can You Stay for Dinner? I saw this recipe and tried it out immediately. I love it when I have every single ingredient needed! Anyway, the muffins turned out to be pretty good.. my only problem was that i doubled the recipe and it ended up being a little too eggy for my taste. Thanks for the feedback Ruta! Glad you tried them!! wheres the coffee part in the coffee-cinnamon cupcake? Does it taste like coffee on its own? Hey Nadia! You’re right- there isn’t any coffee in the recipe, but I guess I’m referring simply to the traditional coffeecake flavor that these mock- that slightly nutty, deep and roasted flavor. Many coffeecake recipes I’ve come across don’t even call for coffee. Though, on second thought, adding coffee or espresso powder could be delicious! I think the coffee refers to the coffee you drink while enjoying the cake, muffin, or donut. Wish I had a muffine right now!!!! There’s a bakery in the Kansas City area called The Clock Tower Bakery that sells bakes muffins just like these and they are wonderful. Just made them for my kids for a Sunday morning breakfast and they were great! I’ve book marked this and will be passing the recipe under hubby’s nose for weekend breakfast!Sounds wonderful! Made these this morning, they were yummy! Thanks for sharing! Pingback: Petite Lasagnas | Can You Stay For Dinner? Love your writing style; makes me feel like I’m sat at your kitchen counter having a chat over coffee and cake! Just made these and I used whole wheat flour. Yum Yum! Thank you for your recipe! Sinfully delicious! Yum! I JUST made these, they are delish! so glad I found your blog, your weight loss story is so inspiring, congratulations!! I’m making these again for the second time. I add jelly to mine though! Pour half the batter in then scoop a bit of jelly in then cover with more batter… it’s delicious! I made one awhile ago, although it didn’t look as good as yours and mine became a bit bigger, my kids still went crazy all over them, thank you for this share. wheres the coffee in these? Hello, please consider using smaller images. Reading a single recipe blows my browser’s memory usage up about one fourth of my system’s total installed memory. This is because you do not use any thumbnails on the page. So, the whole 10 megapixel monster is always downloaded for each and every picture. It completely destroys my girlfriend’s experience with your site. She says she likes it a lot, but just can’t use it due to this. I mentally bookmarked this recipe awhile back and finally tried it out this morning. These are so fantastic, delicate, rich, “yummy-in-our-tummy” delicious. What I loved even more is how simple they were to make, and a great opportunity to get my daughter in the kitchen to help. Stumbled on this recipe at about 8 this morning. By 11 there was a batch of muffins cooling in my kitchen. Well and truly delicious. Thanks for sharing the recipe! I’ve renamed, though. Among the people I served them to, they will now be called Buttery Balls of Goodness. These look so fantastic! I need to make them. I only have whole wheat flour, do you think I could make them with whole wheat flour? Or would that destroy the recipe? Oh my goodness these look fabulous! I really need to stop bookmarking recipes to try…but they look too good not to try! Oh my goodness! I tried making these and my husband and I fell in love! They were absolutely delicious! Thank you soooo much for this sinful recipe!!! Useful information. Fortunate me I found your web site by accident, and I am shocked why this twist of fate did not came about earlier! I bookmarked it. do people know that coffee cake is called that because it’s a breakfast cake you drink with your coffee? 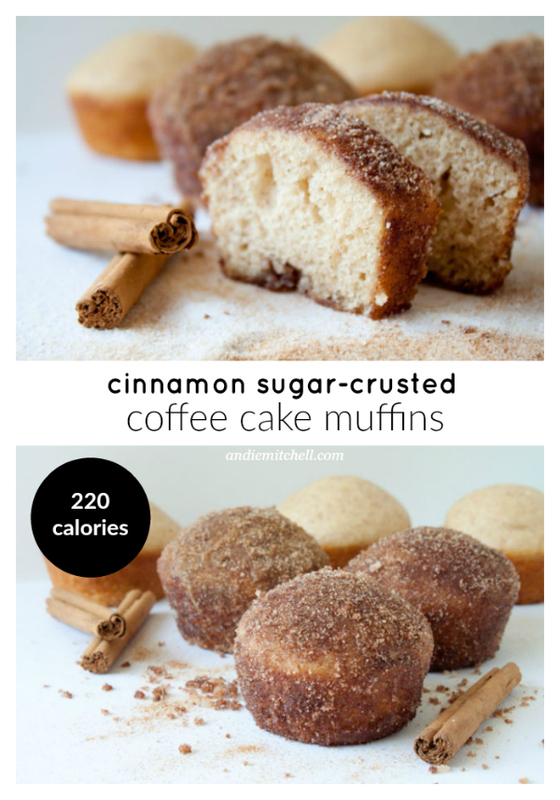 (like you would a donut) there is no – never has been ‘coffee’ in coffee cake. made me chuckle tho’ – this recipe looks amazing! I have a coffee cake recipe that has coffee in it. It’s yummy! I just put all the ingredients for these muffins in my bread machine. Baked it for an hour. When it came out I brushed some melted butter over it and sprinkled it wth cinnamon and sugar. REALLY easy and delicious! I hope this will work in the mini muffin tins so I can use them for a tea. secondly, i made these muffins tonight and zomg they’re amazing. i added vanilla extract to the batter for flavor boost and i think I’m gonna add orange zest to the batter and less cinnamon to the sugar mix next time cuz the sweetness… oh the sweetness. it’s TASTY but without milk it kind of punches you in the face… ever so sweetly haha. I just found your website from a friend on facebook. The muffin recipe looks good, however where is the calorie count someone said thank you for. I dont see it. Sorry, I don’t have the nutrition information for all of my recipes. Love the muffins! Love the blog! I found you when searching for ‘coffee cake muffins’ and these fit the bill. I modified them to vegan and low-fat and it still brings back memories of cinnamon toast and tea with Mom. Will be back for more and sending my friends! I got this recipe from Pinterest… I just made them and all I can say is that they are AMAZING!!!! Oh my cow! These were sooooo good! I made a double batch for Sunday morning church and they went fast! Thank you! Hi, I teaching a Foods 1 cooking class and I am so excited to share this recipe with my students. Thanks. I made thse donughuts and they were awesome! Would not change a thing about this recipe. The kids couldn’t stop eating them! I’m so excited to make these. They look amazing! I just want to make sure I have the measurements correct. Is it 1 and 3/4 cup flour and 1 and 1/2 tsp baking powder? Or just 3/4 cup flour and 1/2 tsp baking powder? I know it’s a stupid question, but I would love to enjoy these the first time and not have to re-make them. Wonderful, we just died and went to HEAVEN!! For some reason your website is very difficult to navigate while scrolling down, it does not do so smoothly. I believe it’s because of your locked side panels of the page. However this recipe was great. I ended up printing it out so I can make again next time. Wow, these are delicious!! They’ll definitely be regular features in my baking repertoire. Thanks, Andie! Do you know the calorie count for these they look great but I’m currently on a diet. Andie posted the calories and other nutrition info in an earlier comment; here you go! Oh I’m so glad I found these again! I made them a few months ago and they were great! They even looked puffy like these which never happens with my muffins. I won’t forget them this time!! Tip: Make them in a mini muffin tin! Almost like doughnut holes! I baked the mini’s for 12 minutes and they turned out wonderfully! I just made these and they turned out awesome. Thanks so much! We call these Dirt Bombs in our house. I’m not sure where that name comes from, and it certainly doesn’t do these heavenly morsels justice. They are such a subtly decadent and wonderful treat that I have to give some away when I make them. I just can’t be held responsible! Anyway, my mother-in-law turned me on to your blog this week and I think I’ve read almost every post. I went to school in Amherst’s neighboring town of south hadley, so I feel like we should naturally be friends. On a more important level, I’m a think-about-cooking-baking-and-eating-almost-every-minute-of-the-day kind of girl, too, so based on that we should probably be sisters. Your writing has great voice, and your story comes alive on the page errr…screen. I look forward to reading it every day, and can’t wait to see what you’ll make next. Keep rocking the blog, sister. You’ve found your niche! Just made these and they came out absolutely wonderful! I omitted the nutmeg since I was out, and I just added more cinnamon and sugar and they came out PERFECT! Thanks for the awesome recipe! I just came across this on pinterest while looking for something to cook my 3yo for breakfast. We have a sweet treat in the am every now and then ;). I can’t wait to try these with a nice cup of coffee!! I just made three batches of these using my mini-muffin pan so they’re bite size, like donut holes, and they’re disastrously delicious! Thanks for the amazing recipe, I’m thinking they’ll be the big hit tomorrow at our church breakfast, thanks again!!! I’ve made these 3 times already and they disappear like magic. 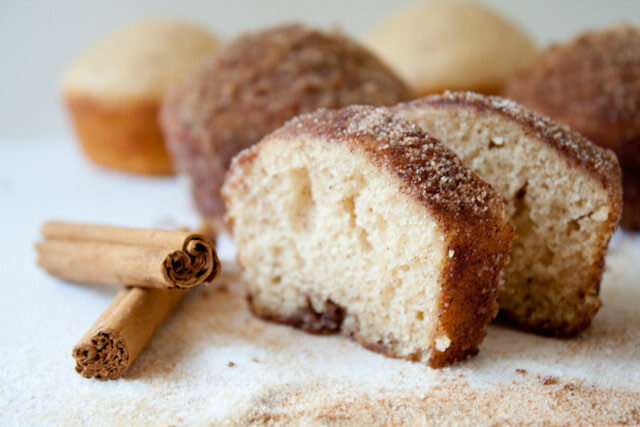 Very delicious and very easy, and the kids can help with the rolling in sugar/cinnamon. Thanks for this recipe. How long will they stay fresh in a ziploc or airtight container? And how many will this make should I choose to use a mini muffin pan? Wonderful recipe! How did you get the “bump” on top of the muffins? I know- isn’t the dome kind of cute? They just turned out that way! Super fab! I did make some alterations nothing serious but I am TRYING to watch what I eat so I did not use whole milk I used 1/2%, I cut the sugar in the muffins by 1/4cup, I added vanilla, and cut the butter to dip them in by about 2tablespoons. If you just lightly dip the top and bottom in the butter while they are hot the sugar sticks to it everywhere. These were great! My husband loved it and we agreed it was like christmas morning. I made a double batch of these muffins on Wednesday. My sons and their friends loved them. Today is Sunday, and my second double batch is in the oven now. I love a recipe that is quick, easy, and requires only on-hand ingredients. I think I’ll make these again for my Halloween open house. Thanks! My goodness this looks fantastic. We are going to make this for our staff. Of course we will use our Ceylon Cinnamon Sugar for this experiment plus some freshly ground Ceylon Cinnamon Sticks. Will post pictures in our blog in a few weeks. But don’t if we can match this level of baking skill though. And photography was lovely. Thanks for sharing. I’ve made this many times, and they always turn out wonderful. They are light and sugary and just perfect. Of course the butter helps too. However I just finished a batch-and they came out flat. There was absolutely no round top to them at all. Does anyone have an idea as to why this happened? Could it be a problem with the stove or possibly not measuring setting correctly? I really do love these though! These muffins are to die for. Just made some this morning for my son and I paired with a nice hot cup of apple cider-AMAZEBALLS!!!!! Great job Angie-really love your blog!!! Just thought I’d drop by and let you know these are one of my favorite “Go To” muffins for brunches and breakfast parties. I made a batch tonight with 1/2 C pumpkin and 1/4 C milk to replace the 3/4 C milk, and holy moly…. Made them this morning…what a great Sunday morning brunch-y item! Quick easy and came out perfect by just following the recipe. Very tasty…big big thumbs up. I came across your website and saw this recipe, went home last night and made it. OMG!!!! it came out perfectly and it’s so sinfully good. This is definitely a keeper. I literally just made these and scarfed 3 muffins down. My kids are currently gobbling them up. This was so incredibly easy to make. There’s a lot of sugar so this will be a recipe I use for special occasions. But wow, these are just so delicious!! Moist sugary cinnamony goodness! Thanks for the recipe! My kids thank you too! for sharing a little bit of heaven with us!!! I’m going to try these out tonight, but with whole wheat flour and applesauce instead of oil. these were THE BEST muffins I have ever made!! they took no time at all to make. Thank you for the recipe. I made theses for my kids before school this week and they were a huge hit. They asked when I was going to make them again before they were done eating! Thank you for such an easy yummy breakfast. Can’t wait to try more of your recipes. OMG i just made these and they are SOOO good. Thank you! I will definately make these again. Looks so yummy! How hard is it to make? I am not a very good baker but I would love to try this out! Don’t be intimidated! This is fairly easy and I’m sure you’ll be just fine. I picked up a heart-shaped silicone muffin pan at Target a week or two ago, with the intent of trying to be that Mom Who Sometimes Does Cute Things On Holidays. (The “sometimes” is there to keep expectations low.) These look tasty, and simple enough to fit the bill for tomorrow morning. Ready… set… (review tomorrow)! … Oh. My. Yumminess. Strangely, I like them better cold. Something about the texture, and the crunch from the sugar and cinnamon… These could be fun to tinker with, too – I saw someone else commented about using pumpkin, which sounds delish. I was thinking cinnamon applesauce might be fun, too. I just made these, and they are incredible! Even better when dipped in the extra melted butter (oops). Thanks so much for an awesome, quick and easy recipe! Yaaayyy my first post! I adore your website and I am slowly cooking my way through it. These were so amazing. Just called a friend over to take some so I don’t eat the whole lot! I made these this past weekend and they were AMAZING! So amazing, in fact, that I had to share the recipe with my readers (though I gave you FULL credit & included links back here). Thank you for posting this! This is a totally awesome and extremely delicious recipe! I only have a very few readers but I shared the recipe with them and linked back to you. You can see it here; http://summdaysummway.blogspot.com/ I just found your blog last night, I am now following you and I LOVE everything I have read so far. You are a wonderful writer and have a great blog! Thank you for some amazing recipes! I made these but in donut form and my family loved them! I got 1 out of the 12! Thanks for the great recipe! I made this yesterday. They were delicious! Family loved them. They turned out just like the ones in the picture. I’ll probably make them again this afternoon since they are all gone…. I do believe all of the ideas you’ve offered on your post. They’re really convincing and can certainly work. So I am in love with your recipes!! You are a terrific story teller and the pictures literally make me wish we were best friends and I was your food tester! The only thing I wish that the recipes contained was serving size and the nutritional info for that serving…..Other than that I LOVE THIS WEBSITE!! Keep up the yummy work! Loved, loved and loved those muffins!! They were great and I had fun dipping them in the butter and sugar! I did have to use more butter but everything’s better with it!! Lol Thanks for posting. Just tried these it is doo good!! These coffee cake muffins are delicious and turned out great, I can’t wait for my sister to try them. Thank you so much for the recipe and the great tutorial. Love, Love, Love them! Yummy looks like a winner in my books!! Gonna have to make these soon! I felt like baking today and since I had everything I needed for chocolate chip cookies, that’s what I made. 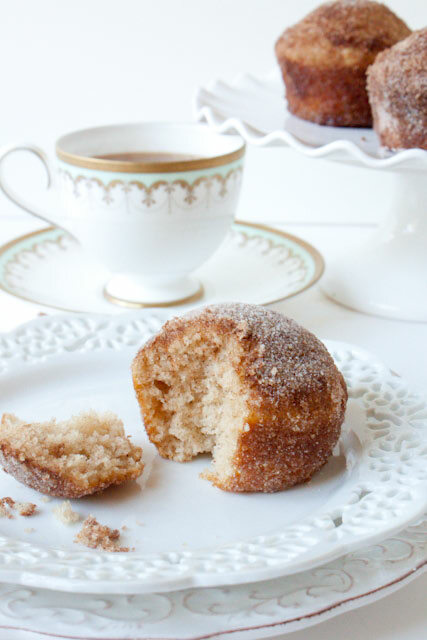 And then I happened upon your Cinnamon-Sugar Crusted Coffee Cake DoughMuffs. Pretty nice looking. And I have everything I need. What to do? What to do? Saw this recipe this morning and looking at the pictures I HAD to make them! Easiest recipe with every day ingredients. Absolutely scrumptious warm out of the oven. Or microwave for 15 seconds any leftovers if there are any. AMAZING!! thank you so much for the recipe, it was so easy to make and tastes…. I don’t have the words. I added a bit of vanilla extract to mine also and it was great. I can’t wait to make these! I was wondering if i could heat them up before eating just so I could make them the night before?? You can absolutely just heat them a little before eating, if you want to make them ahead of time! These were a huge hit with my family, making them again for easter morning! I love cinnamon, so the cinnamon overload going on here looks mighty good to me! 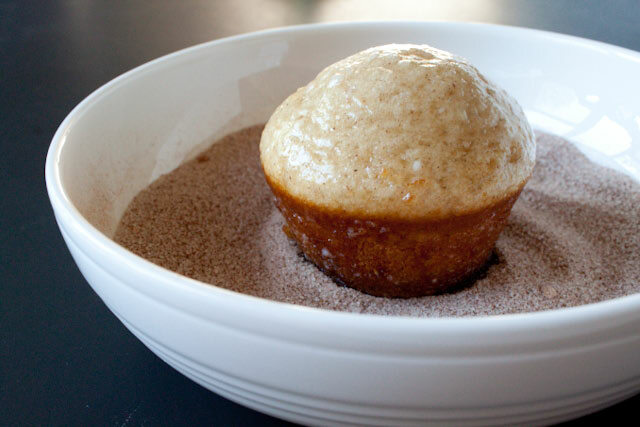 oh my goodness this looks awesome, love cinnamon and sugar together! My teenage daughter had friends spending the night, so I made these for brunch along with fruit salad and yogurt. They were a major hit! 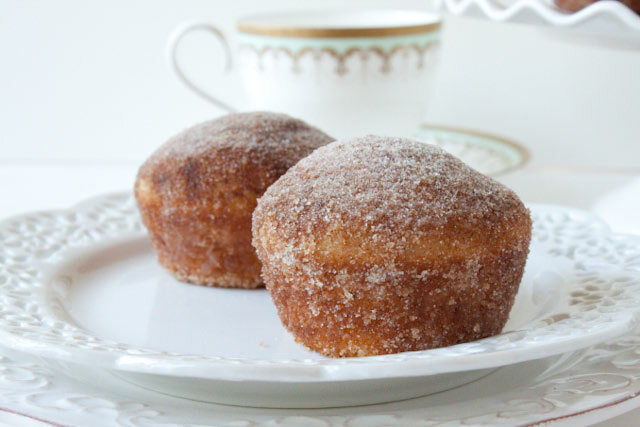 I made them in mini muffin tins and they came out perfectly sized, just like donut holes. I think if they were bigger, I would worry about the cinnamon sugar making a mess, but this way they are a nice two-bite treat. Thanks for the great recipe! I made these last week and both my husband and my six year old went crazy for them. They are delicious! I wouldn’t say they’re like a donut necessarily, they’re much more a muffin. They were to die for – thank you!! These muffins look delicious! My mouth is watering!